Thank you Representatives Blumenauer and Vern Buchanan. Representatives Earl Blumenauer and Vern Buchanan, Co-Chairs of the Congressional Bike Caucus, introduced H.R. 1274, the Vision Zero Act of 2015. Communities across the country are recognizing that there is only one number of acceptable deaths on our streets: zero. “Vision Zero” is the goal of eliminating all transportation-related fatalities, including pedestrians, bicyclists, transit users, motorists and passengers. Cities from New York to Los Angeles are implementing interagency Vision Zero plans connecting engineering, education, and enforcement, to reach the goal of ending transportation deaths. Of course Portland is a city that embraced Vision Zero. With Federal transportation support and local advocates, engineers and traffic design experts, our transportation future is looking brighter. Portland families deserve safe streets on which to walk, bike, operate mobility devices, access transit, and drive. Portland Bureau Of Transportation aims to make our transportation system the safest possible and to move toward zero traffic-related fatalities and serious injuries in the next 10 years. Although Portland's traffic fatality rate is among the lowest of the 50 biggest cities, the number of pedestrians, bicyclists, and motorists killed on our roadways each year has remained flat over the past 20 years. During that time period, an average of 37 Portlanders died in traffic collisions annually, including 12 pedestrians, 2 bicyclists, and 24 motorists each year. Safer streets. Safety in numbers. Portland bicycle commuters know by experience the difference in the numbers of other cyclists on the road can make. Bicycle safety advocates believe that the more the numbers of bicycles grow on our streets, the better car drivers and pedestrians and bikes will all get along. And, there are a lot of statistics, especially in recent years, from all around the country in microcosm studies, or macro across the USA, that this is true. However, we are also seeing new concerning problems in bicycle accident safety statistics. The common wisdom holds that the number of collisions varies directly with the amount of walking and bicycling. However, three published analyses of collision rates at specific intersections found a non-linear relationship, such that collisions rates declined with increases in the numbers of people walking or bicycling. The state of cycling in the USA at the end of 2012 no doubt, bicycle riders were enjoying improving conditions and bicycle ridership and commuting is definitely growing. But hard safety questions are materializing in how to move forward. [...] provides provisions for cyclists to ride two abreast, for passing motorists to cross the center line, and for cyclists to ride only as far to the right as is reasonable, so as to avoid hazards. Motorists are required to leave a three-foot buffer when passing a cyclist, and threatening or careless driver behavior, including throwing projectiles at a cyclist, is designated as a misdemeanor. Cyclists are also permitted to ride on the left-hand side of a one-way street, to mitigate the hazard parked buses and taxis present on the right. In the article, Brian mentions one of his cases where the car insurance actually sued his bicycle client for damage to the car as a result of the bicycle v. car collision! "After a man I represented was hit by a car, the insurer for the car made a claim against my client for $3,000 in damage to the car. Although the new law [Senate Bill 09-148] was not yet in effect, I argued that drivers should give three feet to cyclists to be safe. 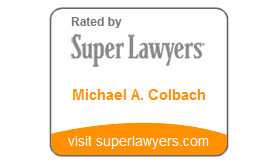 The case eventually settled in a favorable manner for my client." Leaving space while passing a bicycle rider is just common sense to many of us, but in 2012, Pennsylvania also put this law on the books making it legally permissible for the auto driver to cross the line on the road in order to leave this safe passing room while over taking a bicycle. April 9,2012 - [...] Unfortunately, not all drivers are that polite, which is the reason that Pennsylvania lawmakers thought they had to put into writing a requirement that motorists leave a 4-foot "cushion of safety" when passing bicyclists. When oncoming traffic permits, motorists are permitted to cross the center line to provide space when passing bicyclists. A study in Maryland where they also have a new bicycle passing law (as of October 2010) requiring three feet found that cars routinely violate this law. Cyclists in Baltimore, MD were routinely passed at a distance of three feet or less while cycling during morning and evening commutes, which indicates that the three-foot law is not being followed and cyclist safety may be compromised. Risk factors for dangerous passes by motorists were decreasing lane width and the absence of bicycle lanes. [...] The construction of bicycle lanes is a transportation infrastructure solution that would engineer out deficiencies in motorist behavior toward cyclists. Many cities across the nation see rising numbers of serious bicycle accident and fatalities. Yes, bicycle ridership is up, but the correlation and meanings of the numbers are not really clear to the safety experts and city designers what exactly is happening. This is also occurring in some of the best biking cities in the USA, not the worst. This year, through July 8th, there have already been 228 accidents, which nearly matches the total number of collisions throughout the entire year in 2011, and already has surpassed 2010 as a whole. The statistics aren't broken down by type, so they could refer to bike-pedestrian, bike-bike or bike-auto accidents. In 2011, DPD had 239 on record, and in 2010, the total came to 202. Assuming that more cycling accidents will continue to take place over the summer and into the fall -- especially since there are more cyclists on the road in Denver -- we can expect the city to not only break its record on bike accidents by year's end, but shatter it. In Portland, we got similarly troubling news in October of 2012 about the green bike boxes which, granted were an experimental road way design, but, well, we hoped. We do need better and more thorough safety studies of what is actually happening with these green bike boxes, road designers, city engineers to all study the facts, which will be coming. August 21, 2012 - [...] North Wheeler Avenue at Broadway will be closed starting Wednesday morning to right-turn traffic. He said the closure is in response to 20 reported crashes at the intersection between 2000 and 2010, including 17 right-hook collisions involving a person on a bike and a car. It takes time to compile statistics. So, we don't yet know what 2012 statistics will really look like. To be sure, there are good and bad spots, even some very good and hopeful stats. In California, at the end of 2011, many Southern California cities were dealing with much higher bicycle accident numbers than they had seen in previous years. Through October of this year, police have responded to 32 injury bike collisions — more than in all of 2007, when there were 24, and nearly as many as the 33 reported in 2008, Lt. J.J. Puglisi said. Burbank police officers also noted the increase not just in the number of these accidents but also the severity. Burbank also has some great bicycle boulevards and an ambitious bicycle master plan they released in 2009. New York City has a promising bike sharing program, and increasing miles of bike paths and designated bike lanes. In NYC we see the challenges facing bicycle riders, pedestrians, and car drivers, in a blown up sort of way - way bigger numbers of all types of transit users. In New York City there have been growing tensions between bicycle v. pedestrian accident and fatalities. In New York, a huge number of people are pedestrians, and the bicycle riders have been growing in numbers the last several years especially. More than 500 New York City residents are injured badly enough to be treated in hospitals after being struck by bicyclists each year, according to an analysis by Hunter College professors. The number, while small compared with the number of pedestrians injured by cars, is a much higher figure than an earlier study by the same researchers found. The professors surveyed hospital data gathered by the State Department of Health between 2007 and 2010 and found that roughly 1,000 pedestrians in New York State were seen at hospitals each year after being hit by cyclists, and that 55 percent of the accident victims were in New York City. A 2009 analysis of different data by the professors, Peter Tuckel and William Milczarski, found that only a few more than 1,000 pedestrians were treated annually in hospitals in the whole country for injuries in collisions with cyclists. The tension between pedestrians and bicycle riders in New York City continued into 2012. Interesting data sets were compiled. Of course, car v. pedestrian injury and fatalities are much higher numbers than bicycle v. pedestrian. In addition, bicyclists themselves are injured or killed in much higher numbers by accidents involving cars, or often, trucks. The data has been hopeful. Bike paths, bike lanes do help. The numbers of bicycle riders on the streets in New York City are growing at fantastic rates, and yet, these incidents are actually reducing in frequency. Leitch complains that "Bike riders have taken over this city," and says that his wrath against cyclists arises from his identity "as a pedestrian, as someone giddy to live in one of the few cities in America where you can just walk everywhere." But as a pedestrian, Leitch should be encouraging cycling: as cycling rates nearly doubled from 2007 to 2010, the number of bike-on-pedestrian crashes dropped 9%. The number of cyclist-caused crashes fell as well. Cars are 365 times more dangerous to pedestrians than cyclists, according to City data. 60% of fatal pedestrian and bicyclist crashes are caused by illegal driver behavior. 27% of crashes that kill or seriously injure pedestrians involve a driver failing to yield. More pedestrians are struck by vehicles crossing the street with the signal (27%) than without (20%). The rate of bicycle riding growth in New York City has gotten contentious. Bicycle riders are getting tickets and very high rates, while, the cyclist community contends that drivers, and crash-causing-injury-making drivers are not getting ticketed, it is bringing the actual data to light, especially over the last year. Of seven fatal crashes reported by Streetsblog and other outlets, no motorists were known to have been charged for causing a death. Historically, nearly half of motorists who kill a New York City pedestrian or cyclist do not receive so much as a citation for careless driving. [...] Across the city, 976 pedestrians and 328 cyclists were reported hurt in collisions with motor vehicles. Per NYPD policy, few if any of these crashes were investigated by trained officers. There's a lot of bright spots in the contentiousness of New York City's bike growth. New York City Department of Transportation (DOT) Commissioner Janette Sadik-Khan today announced a continued steady increase in commuter bike riding in New York City, with an 8% increase in bike riders counted at commuter locations this year compared to last year's record number. According to counts of bike riders made at six commuter locations, bike riding has increased 102% compared to 2007 and by 289% compared to 2001. In that time, safety has increased for all street users, with fatalities at their lowest levels in the century that records have been kept, while serious bike injuries and fatalities have remain unchanged despite the near-quadrupling in bike riding. Salt Lake City's investments in bicycle infrastructure, including approximately 50 lane miles of new on-road bikeways and locally designed "green shared lanes" in the downtown area, are paying off with a one-year 27 percent increase in the number of bicyclists, according to the City's second annual bicycle count.